Some of the information on this guide has been copied and/or modified from Melbourne University Beginning Research libguides. 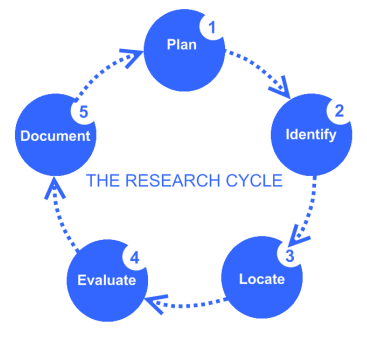 Plan how you will tackle the research. Identify possible resources to use such as: journal articles, books, newspaper articles, or websites. Locate resources in the library and online. Evaluate the resources you have found critically. Document the details of the resources you use. Use the tabs at the top of the page to navigate through the guide. Why can't I just google it?